So it was announced today that Secret is shutting down. Part of me is completely shocked, and another isn’t all that surprised. Secret has had a lot of problems over the last year and frankly, I haven’t seen them do anything to fix any of them. Secret blew up last year at SXSW and was everywhere after that. I’m serious, you couldn’t get away from the damned thing. 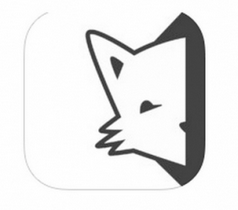 Along with Whisper and Yik Yak, Secret made anonymous messaging handy and fun. Secret screenshots and threads showed up on Facebook and BuzzFeed and essentially took over spring of 2014. Yet, like Yik Yak did, Secret encountered a lot of criticism over the issue of cyberbullying. As far as I’m concerned as a spectator and casual user, Secret never really addressed any of these issues. Cyberbullying continued to plague the service (at least that’s what I heard from other users), and I never really saw any major PR campaign by Secret to really dispel any of the criticism. In my opinion, that was their first major mistake. Then in December of last year, they made their second major mistake. 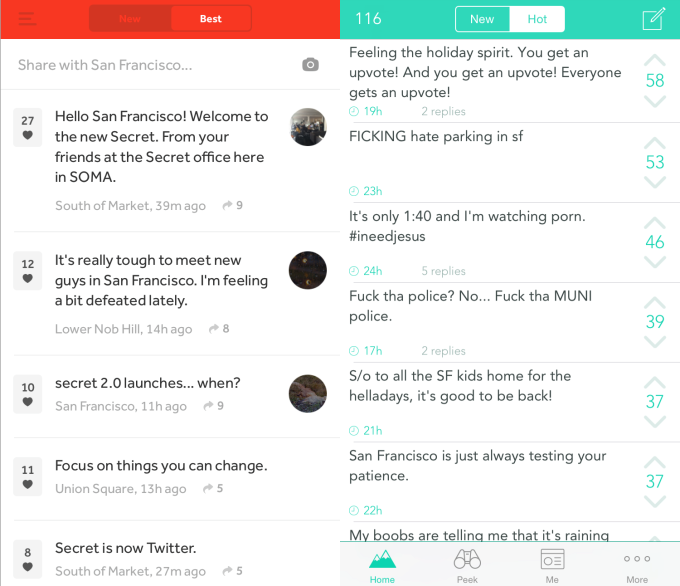 Secret completely “redesigned” their entire interface. The app was redone from top to bottom. Here’s why the word “redesigned” is in quotes: they didn’t redesign anything, they just copied Yik Yak. No, they weren’t “inspired” or “influenced” by Yik Yak—it was just a shameless, lazy, total ripoff clone. And I wasn’t the only one who thought so. If their second major blunder set the stage, their third and final misstep locked in their fate: they really didn’t do anything about the criticism they got for essentially cloning Yik Yak’s layout and design. I don’t know if Secret’s leadership just kept hoping the backlash would go away or just didn’t care, but their inaction signed their death warrant as far as I’m concerned. Frankly, after such a series of serious blunders, today’s news isn’t as much of a shock to me as it might otherwise have been. They should have acknowledged and met criticism of cyberbullying head-on. They should have addressed it and appeared to take it more seriously than they did. They should have dumped major amounts of money into both looking for a cyberbullying-solution, and a massive PR campaign to set themselves apart from their anonymous messaging peers. The PR campaign should have centered on the fact that cyberbullying was their top concern, and that they weren’t hiding from or shirking responsibility; they were facing the problem head-on. This would have endeared them more to their userbase and the public, and possibly could have served to give them a leg up on their competition in the space. They should not have shamelessly cloned Yik Yak’s design. It was painfully obvious to everyone (even non-users), and pretty much tarnished their reputation. They came across as having no vision for their company, and as preferring to copy one of their competitors rather than do the hard work to underscore and highlight their unique qualities. The major redesign had to cost a pretty solid amount of money. I would have used that money instead for the cyberbullying problem, and put it towards the solution and PR campaign outlined above. This is the biggest kicker: they should have pulled back the “redesign” within a week and admitted their huge mistake. People understand and respond to others who act in humble and human ways, even if that means sometimes making mistakes. By not admitting their major blunder, Secret pretty much alienated the rest of their userbase. Earlier this week we made a huge mistake. Our redesign did not convey the message we wanted, and we have decided to revert back to the original Secret for the moment. We do not want to be anyone other than who were are, and we know that our next step forward will better convey our vision for what we know Secret can be. Our next step will act as a tribute to our past even as we embrace our future. We never want to lose the unique qualities that make Secret so special, and we will go back to the design-board so we can better convey those qualities which we love so much. This is not the end; just a little bump in the middle. Our next step forward will be our best yet! Unfortunately, I did’t see any release statement like that from Secret. Why Are They Giving Up? Where’s the Fight? That is all that it would have taken to convey to me that the people at Secret are human and have the best intentions. It would have confirmed for me that the leadership at Secret is committed to succeeding as themselves, and not trying to as someone else. Unfortunately that wasn’t the case, and now Secret’s hitting the deadpool. What must be the most bitter pill to swallow for investors is the question of “why.” If I was an investor, knowing that Secret still had ~$35M in the bank, I would be wondering why they don’t just pull back and regroup. Where’s the fight? They have the funds, the (somewhat) intact userbase, the reputation, and the manpower, so why are they just throwing in the towel? That must be the most disappointing question for everyone involved to be struggling with right now. I know that’s what would be going through my mind as I cleaned out my desk. This entry was posted in Business, Journalism, Management, Startups, Tech and tagged Business, Journalism, Management, Messaging, Secret, Startups, Tech by adammarx13. Bookmark the permalink.